Is Optimism Still Possible In the Age of Trump? When I finished the final draft of Reclaiming Civilization and submitted it to my publisher, the US presidential election campaign was still in the party primaries. It looked likely at the time that Bernie would win the Democratic party ticket, and most everyone I knew including my conservative friends regarded Trump’s candidacy as a joke. We all know what happened next. And now there are neo-Nazis marching openly in the streets of major American cities; racist police officers shooting black people without provocation; five states in the northwest are on fire; climate-change-related flooding in Texas and hurricanes the south-east; and the president appears prepared to force a constitutional crisis and to start a nuclear war with North Korea. And that’s just some of what’s horrible in the United States, to say nothing of what’s happening in other countries. 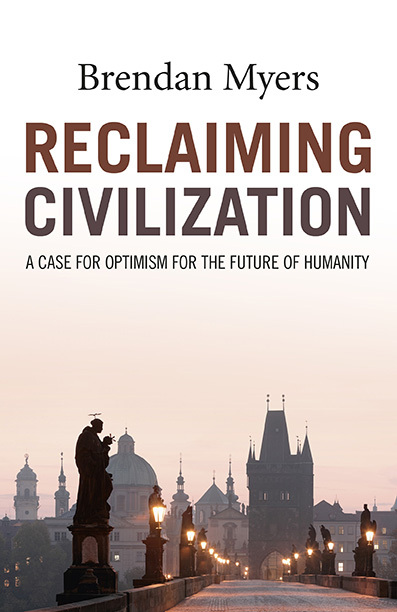 So it may be strange to promote a book whose subtitle is “A case for optimism for the future of humanity” at a time when it appears that there’s almost nothing to be optimistic about. But I also wanted to know why we got here. What’s wrong with civilization? Let me briefly describe what I found when I reasoned about that question. One of the purposes of civilization is to produce people whose character and disposition reflects some model of “the civilized person”. Different societies will have different models of the civilized person; but whatever the model, they’ll deploy its political, economic, religious, cultural, and social forces to influence people to become more like that model. And we have some remarkably terrible models of the civilized person. Homo Economicus. Patriarchal Man. Someone who is born a straight white man is someone who could embody one or both of those models. That person would be rewarded for doing so, and punished for not doing so. Suppose someone could not possibly embody Patriarchal Man, because they’re black, or asian, or a woman, or whatever. That person would have to defer to (or obey, or give way to, or give precedence to, agree with, etc.) the people who do embody the Patriarchal Man. Or be punished for not doing so. It’s obvious to me that models of the civilized person like Patriarchal Man are ethically terrible. But I also think the solution can’t involve inventing new models. I think we need to look at the problems in the public sphere in an entirely new way. Hence, my theory that the root of our social and political problems has to do with the maintenance of illusions. Originally invented to stave off nihilism and despair, they now also serve to export a lot of unnecessary suffering on to the marginalised people of the world. – the illusion of “no alternative”. Such is the short version of the argument. If my thesis about civilization is correct, we should see the civilizing forces move to punish people who renounce or who refuse to defer to that model. In the example of transgender women, that’s exactly what we see… For a person born a man, and thus born in a position to assume the benefits and privileges of the patriarchy, yet instead who undergoes the chemical and surgical and social process to become a woman, appears in the eyes of the patriarchal man as evidence that there might be something wrong with the image of the patriarchal man. Contemporary psychologists have found that strong reminders of mortality tend to make people more conservative and nationalist, and more likely to express racial or religious prejudices. More than 200 scientific studies over the past 25 years confirm this… Simple knowledge of their [the Other’s] existence is enough to prompt the envious and fearful feeling that ‘we’ will not survive because ‘they’ will some day out-breed us, economically out-produce us, or even come down from the hills and kill us. They don’t have to threaten anything; they just have to exist. A particular variation of the illusion of higher and lower men is the illusion of the virtuous prince. In this case, the glamour is cast not only upon a society’s nobility, but particularly upon a society’s leading individual, its commander-in-chief. This illusion serves the same purpose as its predecessor: to preserve the political and economic powers of whomever happens to already possess those powers. What makes this illusion insidiously interesting is that, unlike some of the illusions previously discussed, the person projecting this illusion need not actually believe it. Indeed, he may know perfectly well that the truth is the exact opposite of what the illusion portrays. Fourth and finally, yet perhaps most importantly, many of the things we need to do to bring about a better world are things we are already doing. I hope you will take a look at my book, consider its ideas seriously, and experiment with them in your communities. What other illusions might there be? What other sources of optimism might we discover if we let go of them? I want to know! I hope you do too. Watch my “Book Trailer” on YouTube, here. One Response to Is Optimism Still Possible In the Age of Trump?